The interior of the Honda Pilot has plenty of space for passengers, with a second and third row of seating. The Pilot also offers interior flexibility, as you can use the back rows for passengers or fold those rows flat to create more storage. Don't need quite as much room? The Pilot also has the option of second row bucket seats, which adds luxury but reduces capacity to seven passengers. The Pathfinder's roomy interior also sports second and third rows that fold flat, as well as a hidden storage compartment. The Pathfinder also has the ability for the 3rd row to recline too. This is priceless on those family road trips, as is the Nissan's extra legroom. This one was a close race. The Pathfinder has a rear camera for reversing, a blind spot warning system, and Forward Emergency Braking to stop you from rear-ending the car in front of you. With these safety features as well as the basic safety package on board, the Pathfinder received a five star overall safety rating. One extra feature that the Pathfinder has that the Pilot doesn't is the AroundView Monitor, which creates a 360-degree view of what's around the car. This is great not only for safety, but also for tight parking situations. The Pilot has a five star safety rating also, along with the same safety features as the Pathfinder minus the Aroundview Monitoring. The Pilot pulls ahead because of its Lane Assistance feature. It was a close one, but we feel like if you had to choose between the two features, the Lane Assistance is a better safety option to have. 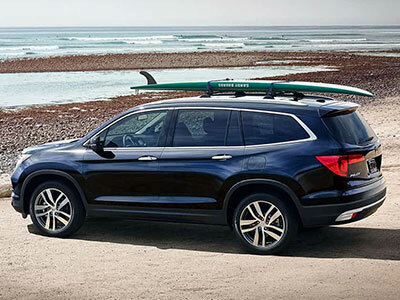 The Honda Pilot has added some impressive options to ensure driver comfort, including heated front row seats and a heated steering wheel. For back seat passengers, the comfort continues. The 2nd row slides forward to allow easier access to the back row, and the back rows have separate A/C controls for more independent comfort. The Pathfinder also has a heated front row and steering wheel but ups the ante with the addition of heated back row seats. We also like the convenience of the Pathfinder's second row slide feature, which allows the movement without folding the seat back. It may seem like a less important feature, but for parents with car seats, it's huge. Passengers can get into the 3rd row without taking the car seat out. As if those weren't enough, a motion activated lift gate allows you to open the lift gate while your hands are full. 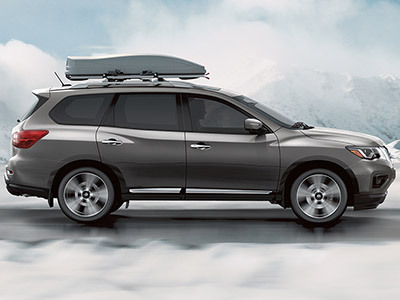 The Pathfinder designers have thought about what vehicle owners want and need, and they have delivered. To be honest, it's hard to find a winner in the technology category because both the 2017 Nissan Pathfinder and the Honda Pilot are so comparably equipped. The Pilot is equipped with HondaLink which allows you to stream music, check traffic conditions, and more. It connects to your phone so you can access the apps from the in-dash touch screen. The Honda has HondaLink, and the Pathfinder has NissanConnect. NissanConnect is a very similar system that allows you to stay connected during your drive Both have an 8" high definition touch screen. Both can be accessed through the touch screen or by voice activation. However, we are going to give to Nissan because the Pilot's touch screen interface is needlessly complicated and it lacks a physical volume knob, an oversight which we find to be quite inconvenient. Both of these spacious crossover SUVs are awesome choices for a family that wants both performance and passenger space. Both have a high safety rating and great connectivity. The 2017 Nissan Pathfinder, however, wins the day with a some impressive interior additions that makes riding and driving more comfortable, as well as extra space and flexibility.